President Donald Trump, flanked by Secretary of State Rex Tillerson, left, and Defense Secretary Jim Mattis, speaks during a meeting, June 12, 2017, in the Cabinet Room of the White House in Washington. The Trump administration has recently been reviewing its strategy toward South Asia. Days after the Pentagon announced it is withholding $50 million intended for Pakistan as part of its Coalition Support Fund, the South Asian country’s ambassador told an audience in Washington that Pakistan remains determined to fight terrorism. 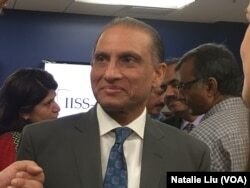 “All that Pakistan has done in the fight against terrorism has not been sufficiently factored” into Pentagon’s decision, Ambassador Aizaz Ahmad Chaudhry lamented during a discussion at the Washington office of the London-based International Institute for Strategic Studies. Aizaz Ahmad Chaudhry, Pakistan’s ambassador to the United States, speaks at an event in Washington, July 26, 2017. Air rights up for negotiation? Pakistan may not be the only party to question the other’s sincerity. Questions concerning Islamabad’s commitment to the bilateral partnership have also been raised by the U.S. A prime example was the discovery in 2011 that al-Qaida leader Osama Bin Laden had been living undisturbed near a key Pakistani military facility. U.S. Secretary of Defense James Mattis said he withheld $50 million in Coalition Support Funds because he couldn’t certify to Congress that Pakistan had taken sufficient action against the Haqqani network, a Taliban-associated organization which the U.S. has deemed a Foreign Terrorist Organization, since September 2012. The group has been blamed for attacks in Afghanistan, which have contributed to the country’s destabilization, an issue of concern to the U.S.
For its part, Islamabad’s message is don’t drop “every security lapse in Afghanistan on Pakistan’s doorsteps,” as the country’s ambassador to the U.S. put it. The Pakistani envoy’s remarks came at a time when U.S. President Donald Trump's administration has been reviewing its overall strategy toward South Asia, including India, Pakistan, Afghanistan and Iran. 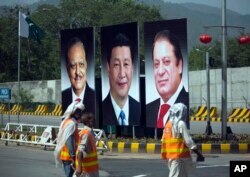 FILE - Municipality workers walk past a billboard showing pictures of Chinese President Xi Jinping, center, with Pakistan's President Mamnoon Hussain, left, and Prime Minister Nawaz Sharif on display during a two-day visit by the Chinese president to launch an ambitious economic corridor linking Pakistan's port city of Gwadar with western China, in Islamabad, Pakistan, April 20, 2015. Chaudhry contrasted the U.S.-Pakistan friction with his country’s relations with China, which has been investing heavily in Pakistan as part of its One Belt-One Road initiative. Pakistan and China “have so much of meeting of minds” and no “policy differences at all,” he told VOA. "We support each other's causes. Chinese people respect us, and we respect them." In a subsequent statement to VOA, the Pakistani Embassy in Washington again stressed the need for respect. “Pakistan looks forward to working with the United States in achieving enduring peace and prosperity in the region as a shared interest and on the basis of mutual respect,” it said. The statement also highlighted Chaudhry’s remarks at the IISS forum about Pakistan’s sacrifices in the war against terror. In his interview with VOA, Chaudhry said he remained “very optimistic” about bilateral ties with the United States and sees points of convergence between the two countries increasing. “There is every reason for us to continue to work together,” he said. In discussing Pakistan-China relations, Chaudhry told VOA “the clearest example and manifestation” of Sino-Pakistan ties has come in the form of the China-Pakistan Economic Corridor, or CPEC, stretching 3,000 kilometers from Kashgar in western China’s Xinjiang region to the Pakistani port city of Gwadar on the Arabian Sea. Earlier this year, Pakistan announced it has leased operation rights for Gwadar to a Chinese company for 40 years. Details of the lease are not fully public. Andrew Small, a senior fellow at the German Marshall Fund of the United States (GMF), said the formal terms are understood to be purely economic in nature. However, “that doesn’t preclude its being developed for military purposes further down the line, and both sides certainly have that in mind,” he added. Small is author of The China-Pakistan Axis: Asia's New Geopolitics. Could China extend Pakistan partnership model? What appears to be China’s determination to make the Sino-Pakistan partnership a success story, analysts say, may have to do with Beijing’s global ambitions. “As its need grows for friends who can facilitate the extension of its reach as a global military power,” China is now trying to turn its relationship with Pakistan into a model for other potential security partnerships, Small said. 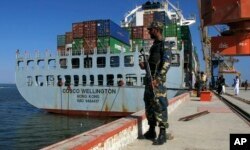 FILE - A Pakistan Navy soldier stands guard while a loaded Chinese ship is readied for departure at Gwadar port, Nov. 13, 2016. “For various reasons, Pakistan still values a good relationship with Washington,” the analyst said. Among reasons may be what Islamabad perceives as a measure of international prestige gained from its association with Washington. The challenge for Pakistan today, analysts said, is whether the country can seize its current opportunities and rise above a past laden with border disputes and domestic instability, so it potentially can be seen as “an emerging market, even a future rising power,” in Small’s words. “Over time, Pakistan would be better off charting its own course toward better relations with its neighbors, and lessening its dependence on both the United States and China,” said Ambassador Robin Raphel, a former assistant secretary of state for South Asia. In his view, the ultimate consideration for Pakistan's cooperation with China on Gwadar and CPEC, their economic corridor, comes down to the question of “economic empowerment of the people living in Balochistan and the rest of Pakistan.” The southwestern province of Balochistan, which the economic corridor traverses, also is known as a center of Taliban activity in Pakistan. Changes have been made to this story to correct inaccuracies introduced during editing and better reflect the tone of Ambassador Chaudhry’s remarks.